You will likely not be able to run the RS180 in either a 0.22 sealed or even 0.49 vented box and approximate this project. The boxes are closer to 1ft^3, and the RS drivers are better vented if you want any kind of bass extension. I would disagree with your assumptions on how a sealed box will perform. 88Hz will not be enough extension, IMO. Nick has laid out the sizes and parts for the xover already, so you can find that info yourself. This is not Scott's project, and to ask him to redesign it is not a question he would have the info for. Just read the FAQs in the column on the right. Hello Wolf, The 0.22 cuft and 0.49 cuft are numbers given by tech support at PE. Pls see the attached snapshot of email response. On further querying PE clarified that a sealed enclosure is louder etc. It was by chance I came across the Amiga kit on PE website and realised that the woofer is same as the design I wanted to build. And then I came across this thread again by chance on Sunday. I saw that Nick had mentioned to consider the Amiga enclosure design..., which is approx 1.07 cuft .. and was surprised that this is more than twice what PE support suggested, 0.49 cuft. (based on Bassbox 6 Pro). Well, now I guess I will need to seek further clarification from PE support. Thanks for the pointer to Paul Carmody's DIY site. It is not problem. There can be a lot of confusion around different types of boxes, sizes, etc. I chose a bigger size due tot eh fact, that I wanted to get a lower F3. In this way, you can get taht woofer to play in the 30 hz range. Which for movies, especially, is a nice spot to be at. Of course, I planned this to be full-range. At least as best as you can get with two drivers. Parts Express will always offer recommended enclosures. What you will find out, that people who design enclosures often do their own testing to make a box that fits their design goals. In this case, a larger box nets a lower frequency response. 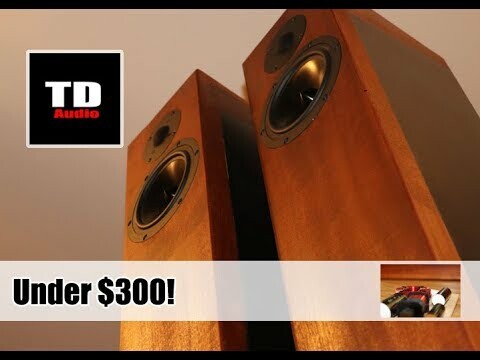 If you are familiar with WinISD, it is a great free program that will help you decide on box design if you were to design your own speakers. I even teach the very basics of the program from importing a driver to the basics of what to look for when designing a box (ie excursions, air velocity, etc). The best part for you, is it converts everything to metric, so you don't have to convert it yourself. Don't hesitate to ask questions. We all have to learn. It is the only way to get started. Thanks Nick! That was reassuring. I shall try the free software you suggested. Wolf would be correct; I cannot, and will not, redesign someone else's design. To do so would be arrogant and disrespectful on my part towards Paul. You won't have to make any crossover changes to the Amigas if the only change you are making is to use sealed cabinets instead of ported. With regards to the cabinet, you should ensure that your cabinet width is the same as the original design and that the driver layout and spacing on the front baffle is the same as the original design. If those stay the same, no crossover changes will be needed. My one question is if your setup will include a sub? The RS180 as you have seen doesn't play nearly as low in the smaller sealed enclosure. With an F3 (-3db point) at 88hz, you are missing a lot of the lower frequencies found in music. A low E on a bass guitar is around 40 hz as an example. One of the strong points of the Amiga design, or rather the RS180 itself, is its ability to play low in a reasonable sized ported enclosure. My point is that unless there is a really compelling reason (i.e. space constraints) then you would be better served with those drivers to use it in the enclosure size that Paul or Nick have used here. Nick- that is not what I suggested. The 2 components should be in series, and placed across the woofer. What you have there won't do much. scottvalentin Thanks, for the clarity. Yes, I got the same response from PE-Support that no change to the cross-over (from Nick's design) is required, if I opt to go for a sealed enclosure, and not ported. Yes, I have planned to build a DIY sub too once I make the pair of 'bookshelves'. My main reasons for a 'sealed enclosure' are: a. Sealed will give a louder, crisper and tighter sound (SPL); b. Will be easier and simpler to make; c. My very first DIY speaker wayback in 1987 was as sealed box, and it sounded great. This will be my second DIY after 31 years, and I thought to keep it simple. I noted your advice to go for ported design and enclosure size. Thanks. By the way, PE-support re-confirmed that the optimum ported-enclosure volume for the RS180 is 0.49 cuft. And, for sealed it is 0.22 cuft. When I asked them if I could increase the sealed volume to say 0.4 cuft (a respectable sized box- internal dimensions 12" x 8 " x 7"), he said it was okay and the maximum I could go. However, he added - 0.22 is better. So, I'm really unable to understand how come Paul Carmody went for a 1.07 cuft volume? Do you have any thoughts on this? Or on anything else I've mentioned here? Thanks for those notes. I do want to correct you on your first reason for going sealed - "Sealed will give a louder, crisper and tighter sound (SPL)" It will not below a certain frequency and will be equal above that frequency. "TIghter" is not something sealed does and ported doesn't, billfitzmaurice has lots of knowledge on this myth (amongst many here). But the fact is that sealed is NOT "tighter". Room placement and room modes/interactions are what will make bass boomy or tight (or incorrect box size/tuning in the case of ported enclosures). Ported done right will not be "looser" than sealed. All that said, the sealed .44 cu foot looks not bad, the 6 litre is OK and not too far off the 12 litre, but again, you are missing the main strength of the RS180 which is its ability to play low in a moderately sized enclosure. Also, if you don't know, this is a free spreadsheet called Unibox, just google it and you can play around with different sizes and tunings to see for yourself. scottvalentin Thanks a lot for the corrections, advice and the comparisons. It's great help and reassuring. I now feel, may as well go for the ported design.. I' apprehensive about getting the port dimensions perfect. Anyways, lemme see. Hope the Unibox is available for Mac too (I use a Mac, not a PC). Will search for it. Nick had suggested another free program - WinISD.., which is not available for Mac when I tried once. I shall update here once I make these speakers. Good luck on the build!! For the port, the two concerns are the box tuning and the diameter as it relates to port velocity. All you want is a diameter that is first, easily obtainable (i.e. PVC pipe or the Precision Port offerings) and a diameter that is large enough to keep port velocity in check at the maximum volume you expect to listen at. To make it easy, just use Paul's port dimensions and diameters. Unibox will model the velocity as well if you need to diverge from Paul's model. If Mac does Excel, Unibox should work fine. The one nit that I'll pick in your design is the notion of using these in an HT setting. I have little doubt that the RS180 will reach down to the 30s in that box, but while I don't know you or your SPL preference, in my HT setting I like it LOUD to go along with the boom, and an RS180, with its limited xmax, will simply run out of gas in that alignment, long before my desired movie SPL is reached. Every alignment I've ever tried for any version of RS woofers breaches xmax with relatively low amounts of power applied (seriously, 10 watts), and in an ugly fashion. Having them do serious HT duty might result in a spectacular special effect, but only in one movie.